Artist Belynda Henry has an enduring appreciation for the beauty of Australia’s rural landscape. It’s this authentic focus that led her on a journey from studying Visual Arts in Sydney to becoming a mainstay in how the Australian terrain is portrayed in contemporary art. For more than 20 years Belynda Henry has devoted her paintings to capturing natural scenery from a distance, landing her many accolades including shortlists in the Archibald Prize and Wynne Prize. For her upcoming exhibition ‘Reflections’ at Flinders Lane Gallery in Melbourne, Belynda changed her tune slightly, to really immerse herself in one area instead of numerous landscapes. 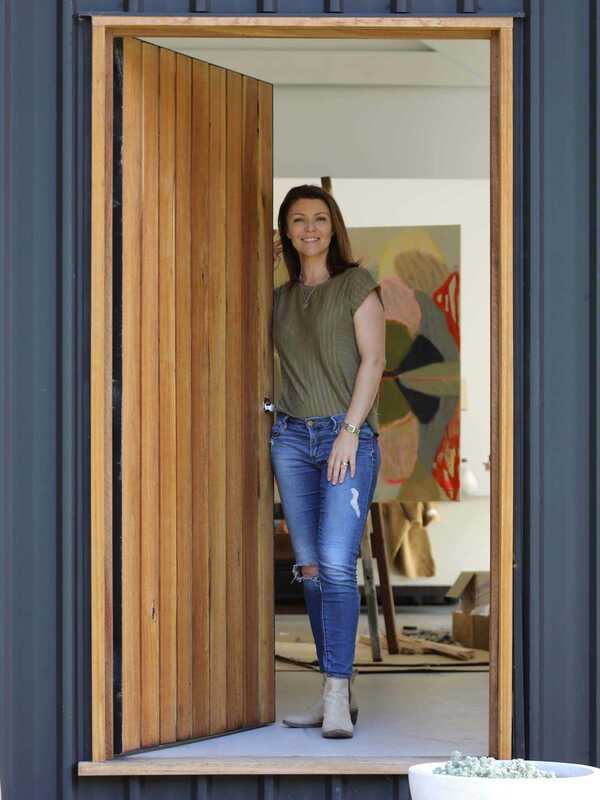 This was sparked by a move from her home of 17 years in the Central Coast hinterland of New South Wales, in the Dooralong Valley —a constant source of inspiration. At her new home within the same undulating area, Belynda soon found a fascination with the abundance of vegetation and birdlife down at her neighbour’s dam. It was these everyday encounters that sparked an emotional response for her new collection ‘Reflections’. ‘Reflections’ also differed from the others for Belynda because of her en plein air study of the landscape, who has always worked predominantly from her studio. In anticipation of her upcoming exhibition, EST Living caught up with Belynda to chat about her creative process, style development and what to expect from the artist in 2019. ‘Reflections’ by Belynda Henry opens on Thursday, April 2nd until April 20th, at Flinders Lane Gallery Nicholas Building, Melbourne. What did you study and what path led you to where you are today? Belynda Henry: A Bachelor of Visual Arts majoring in sculpture, performance and installation at the Sydney College of the Arts. I fell in love with art classes in high school in year 10; art was very clearly my passion and knew I was good at it thanks to some great art teachers. After university I began working with a small local gallery, with small works on paper that built up to some landscape works on canvas. I entered the Wynne Prize for the first time in 1999 and in 2000 I was selected with my second ever entry. This was a life changing moment for me. There I was hanging in the AGNSW surrounded by my heroes. This helped me to confirm my career path. I have been painting non-stop ever since. How would you describe your style of artwork? Belynda Henry: I’m obsessed by the landscape; landscapes move me, its colours inspire me. It’s very easy to forget your discoveries along the way, so hopefully I am constantly summarising what I have learned, adding and evolving to my images with each new series of paintings. I can see a constant and steady progression over the past 25 years of painting. The very first paintings still link to my recent works. They are successful to me if I look back and can join all of the dots to make a full journey or life story about the landscape I love so much. How has your style or composition evolved since you first started? Belynda Henry: Funnily, I never liked painting trees. So my early works never had many trees. I loved painting long distance landscapes in the early days, and then moved onto aerial view style and abstract images. One day about eight years ago I decided to add some trees. From that moment, I know people started connecting to my work more and more. That was an important step. Can you give us a little insight into the creative process behind your latest collection ‘Reflections’? Was there an intended message behind this work? Belynda Henry: It was maybe a reflective period for myself also, but really just working from studies and lots of photographs. Hopefully I have fine-tuned a lot of my technical skills. I remember in the early days I was always searching for inspiration, and wondering what to paint. Now I do that automatically; I don’t even know I am constantly researching and gathering. When I walk into the studio or pick up a brush or pencil it really is much easier for me; I paint without overthinking it too much. I paint eight to ten hours most days if possible and feel I am very dedicated to my studio practice. I hate leaving the studio and if I didn’t have a life outside the studio (my beautiful family) I probably wouldn’t ever leave. What is your focus when painting a new collection? Is there a creative process that you follow? Belynda Henry: Well this new exhibition started with moving from our house of 17 years. We sold our home and moved down the valley, to Dooralong Valley NSW. We now live half way up the valley instead of at the very end. It’s 20 acres of new surroundings. My favourite discovery though has been the next-door neighbour’s back dam. This whole show has been based on this dam and its reflections, as well as the bird life, new birds and sounds that were not at the last house. The show started with many trips to the dam with works on paper, then larger works on paper. Bellbird sounds II and I were actually painted over there. I would hike through the paddock with the 155 x 105 cm paper rolled up. I would also take a big piece of fridge cardboard to lean against a tree and clip the paper to the cardboard. I also started some big canvases over there. Once I got going and realised I was painting a show based on the reflections, it was much easier. Belynda Henry: It was maybe a reflective period for myself also, but really just working from studies and lots of photographs. Does your own home in New South Wales Dooralong Valley define your individual style as an artist? Belynda Henry: This is probably one of the first shows focused on a particular place. Lots of other shows have been a summary of many landscapes although the valley is a constant source of inspiration. Lastly, what does 2019 hold for Belynda Henry? What’s next? A Wynne prize entry – I’ve started already. Then onto the next show with Australian Galleries in Sydney, in November this year. I am also involved in a design project, which will be shown at Denfair and the Milan design fair. An exciting project with eight other Australian creative.